Great Olympians and entrepreneurs share the mindset of a champion. In honor of the 2012 Olympic Games in London, I present eight of the greatest Olympic quotes of all time from American athletes – and I’ve spun them into lessons for entrepreneurial success. When Jesse Owens won four gold medals in the 1936 Summer Olympics in Berlin, he didn’t just defeat athletes from all over the world. He also helped defeat the message of “Aryan racial superiority” that Adolph Hitler hoped the Germany-held games would spread. In a way, Owens was racing against racism. But in his mind, he was just racing against himself. As Owens set a world record in 100m dash, the only competition that mattered was the internal battle going on in Owens’ body and mind. While business is perceived as a very competitive environment, most startups are faced with little outside competition early on. A successful idea for a new business, product, or website usually exists in a niche of its own, free from direct competition. The battle then, is in the mind of the entrepreneur. Does she or he have the ingenuity, the drive, and the perseverance to turn their idea into reality? Instead of thinking about every other business, product, or website as your competition, focus your competitive energy internally. When you create an excellent, one-of-a-kind business, the competition is irrelevant. If you’ve heard this advice before, that’s because it’s profound and important. When Peggy Flemming was 12 years old, her coach William Kipp died suddenly in a plane crash. If it weren’t for her intense love for figure skating, she surely would have been discouraged from continuing her training with a new coach. Instead, she won Olympic gold eight years later. If you start a business that you don’t really care about, you’re going to be hard-pressed to persevere when the going gets tough. Centering your business on something you truly love and believe in is the foundation for entrepreneurial success. No Olympian has ever medaled in an event they didn’t like. In life, we should all do what we love and love what we do. Florence Griffith-Joyner (a.k.a. “Flo-Jo”) is considered the fastest woman of all time, based on the fact that she holds the record in both the 100m and 200m. But even she had people telling her that she didn’t have what it takes to win gold. One difficult lesson for every entrepreneur to learn is how to separate positive, constructive criticism from useless, pessimistic nay-saying. The former helps you adjust your business and make it more successful, the latter will simply discourage you from continuing on your path to success. Some people simply don’t believe that greatness can be achieved. They’ll tell you that your business is destined to fail, but they would have told the same thing to Steve Jobs or Mark Zuckerberg. In other words, their opinion isn’t worth your time. At every sporting event, there’s someone booing. At every comedy show, there’s a heckler. And for every musician, there’s a music critic. Recognize that nay-sayers are going to be there no matter what, so there’s no reason to take it personally. Instead, have Flo-Jo’s attitude and stop listening when someone tells you that you can’t do something. But like most clichés, there’s a good reason it’s so often repeated. The only day you can accomplish anything is today. On training days, you can’t be day-dreaming about winning the main event. When the day has finally come for you to perform, all you can focus on is your performance – not the medal ceremony. Sometimes it feels like a catch-22: you can’t succeed as an entrepreneur unless you have a great vision for the future, but you also can’t succeed if you’re always looking ahead and never taking care of the grunt-work of building your business day-in-and-day-out. Successful entrepreneurs manage to do both. But they spend much more time focusing on the present than imagining how great their businesses will be down the road. Remember that for every second an Olympic medalist stands on the podium, they’ve spent hundreds of hours in practice facilities. As a track-and-field athlete, there’s no greater outcome than setting a world record. Lewis set multiple world records and won nine gold medals, so he knows all about achieving the pinnacle of success. As an entrepreneur, there’s always going to be another milestone. Build a million dollar company… and you’re likely to want to build it up to 100 million. This isn’t a problem – unless you expect to get satisfaction and happiness from reaching these ever-changing milestones. True contentment comes from appreciating the daily struggle. 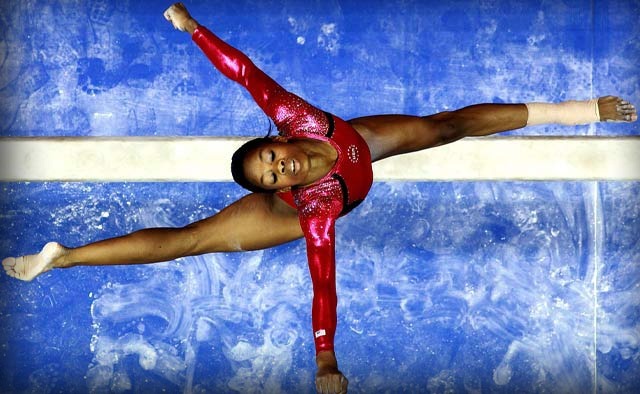 Gabby Douglas has had her fair share of hard days – especially in the last week. In this summer’s London Olympics, he’s received criticism for her hairstyle and for shaky performances in individual events. While building your business, you’ll inevitably face major difficulties. But it’s meeting and overcoming today’s challenges that empowers you to face the challenges of tomorrow. Next time you’re feeling frustrated by a difficult client or a technical problem with your website, ask yourself how facing this challenge will help make you a better entrepreneur in the future. As a football player, you train for thousands of hours all in preparation of one match: the championship. When that big game comes, the players who perform are those who prepared fully. As an entrepreneur, you never know when your big opportunity to will come or in what form it will present itself to you. That’s why it’s so important to be constantly preparing and adding “more fuel” to your fire every day. Think about the different ways the different big opportunities that could take your business to the next level. Maybe a viral blog post sends a deluge of traffic to your site. Maybe Google sends you an email that expresses an interest in your services. Maybe you get stuck in an elevator with Bill Gates. When your big moment comes, make sure you’re ready to capitalize. Every human being is capable of accomplishing great things. Gold medalists and successful entrepreneurs are people who make the decision to rise to their personal potential for greatness. Nick is an American writer, musician, and entrepreneur. He makes creative web videos with his company Next Level Ink.